The folks at Boulder/San Francisco-based Occipital are very much software people — the company’s RedLaser app was a big hit in the early App Store days before the team sold it to eBay, as was 360 Panorama before iOS 6’s Panorama feature took some of the wind out of its sails. Their roots may be in software, but now the team is trying something very, very new. Occipital just launched a Kickstarter campaign for its very first hardware project: the Structure, a portable 3D sensor that straps to the back of your iPad that should ship by next February. Update: Wow, the Occipital team has blown past its $100K funding goal in just over three hours. Those sleepless nights seem to have paid off. The Structure itself is an awfully handsome piece of kit. 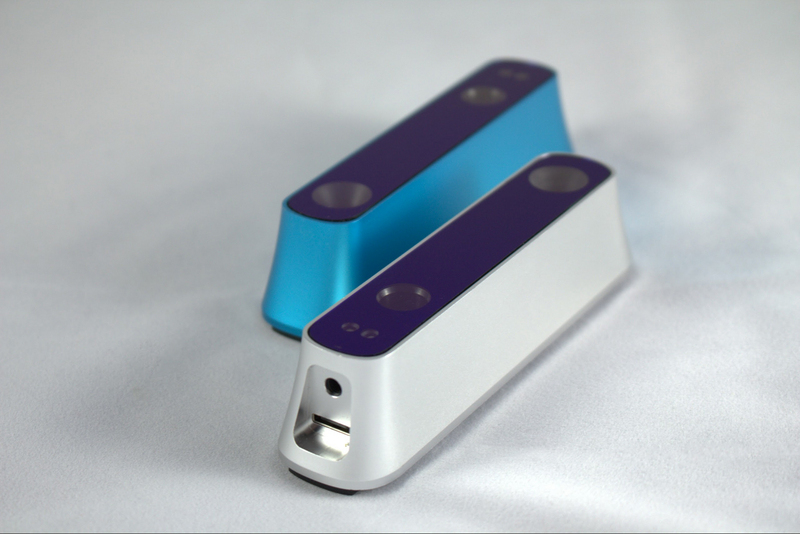 Small and clad in colored anodized aluminum, it doesn’t look anything like the clunky 3D sensors you may have already been exposed to. That’s a testament to the sort of fastidious tweaking that went into making the Structure what it is — there’s a full-sized PrimeSense Carmine sensor in there, but it was up to Occipital to cut out the physical cruft so the Structure could fit in a pocket. Power consumption also had to be cut dramatically since it runs off the iPad 4’s battery (though it’ll technically connect to any iDevice in your arsenal that has a Lightning dock connector). The really astonishing bit is how quickly the Structure works in capturing all of this data. Powers took the Structure and a few of the bundled demo apps for a brief spin in our New York office, and in a matter of mere moment he was able to capture a virtual bust of his ever-present marketing director and firing it off to Shapeways for printing. Scanning the topology of a side room was similarly quick, as was the process of throwing a virtual cat into the mix that would chase after balls that bounced off of 3D interpretations of couches and under coffee tables. That breadth of those demo apps speaks to the sort of ecosystem that Powers hopes will rise up around the Structure in the weeks and months to come. After all, as neat as it is, the market for a gadget that lets its users capture and export 3D models for printing is still pretty limited. Powers’ vision is much more expansive: the SDK that’s being released alongside the Structure sensor will allow developers to build consumer-facing apps that take advantage of all that 3D data. “We’re not really just building a device, we’re building a platform,” Powers said. As far as he sees it, Occipital can’t possibly build every possible augmented reality game or measuring app on its own. Instead, the team is going to make the low level data accessible to developers, and make high level APIs available to developers who know nothing about computer vision in a bid to make the Structure as accessible as possible. It’s not hard to imagine the sorts of applications that could come along with adoption of the Structure. Looking to buy a new couch? Scan your living room and see if that sucker fits next to your bookshelf. Real estate agents could benefit from easy-to-capture, manipulable models of office spaces and homes (though some startups already have a head start on that front). Thankfully, while the Structure is designed to fit on the back of your iPad, ambitious devs can use connect to PCs, Macs, and Android devices thanks to a so-called hacker cable that allows for a standard connection over USB. At first glance, this whole thing seems like a drastic shift for a company that has only ever focused on crafting software, to say nothing of on the production perils and pitfalls that come with building hardware at scale. That’s not to say that Occipital’s 3D ambitions have come completely out of the blue though. Earlier this year the company closed its acquisition of French startup ManCTL, which was best known for a 3D scanning desktop app called Skanect that let users fire up cheapo 3D sensors like the Kinect or the Asus Xtion to capture 3D data and convert them into full-color models in a matter of minutes. Structure, then, seems like the next logical step. It’s a convergence of two seemingly divergent realms of expertise, and it’s arguably happening at just the right time. Smartphones and tablets are growing more capable by the day, which leads people to expect more from their daily companions. And with 3D printers moving into the mainstream, there’s a growing sense of awareness around the value of converting objects and environments into 3D representations. Even the Kickstarter campaign is a sign of the times. Powers concedes that Occipital doesn’t actually need to go the crowdfunded route — he says they’ve got enough left over from its previous funding round to cover these very early production runs — but it couldn’t hurt to help build buzz among developers and gauge demand for a pricey tablet add-on. If you’re interested in throwing your hat in the ring you can lay claim to an early adopter package for $329, but the package will cost you $349 if you wait too long.